This is the story of a little frog who loved to hear his own croak more than anything. 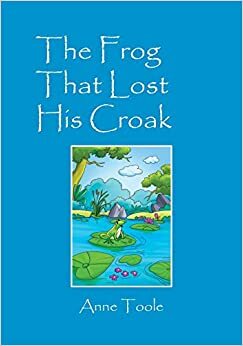 He croaked louder, and louder, over other frogs' croaks. He croaked even at night, making impossible to sleep. He also loved to boast about his croak. One day he got soaked in the rain and lost his croak. He was desperate, but nothing could be done except to rest and wait. In this forced silence he discovered diverse sounds around him: crickets chirping, leaves rustling, wings flapping. How many beautiful sounds he has been missing, only worried about hearing his own croak! Frog's voice came back, and he was glad of being able to croak again, but he also enjoyed listening to the pond's sounds. Cute story told in a rhymed and fluid text. The vocabulary is rich, but not necessary over challenging for the age range. The pages look gorgeous, with colorful illustrations. We played making the noises the frog discovers, and we also kept silent to find out new sounds around the house, and it was really funny.